How do I use available slots? Premium accounts can set the number of employees needed for an available shift. This will help admins and managers know when they have staffed enough people for a particular shift. 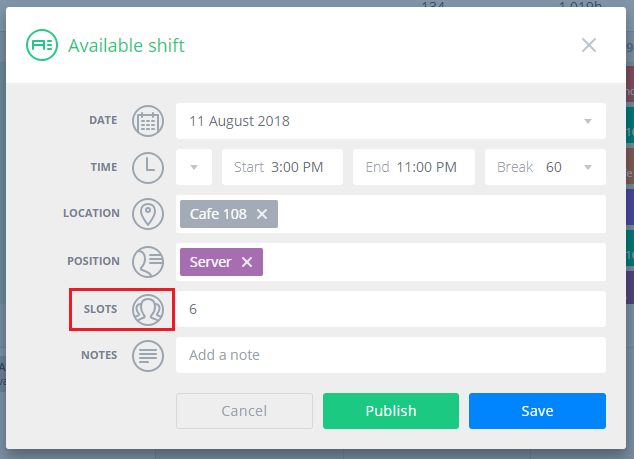 To set the number of employees needed, simply type a value into the Slots field when creating an available shift. 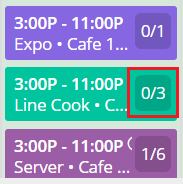 Any time an employee applies for the shift, you'll see a running count from the main view of the schedule. If you enable automatic approval, this means you can set the number of employees needed within one shift, and the first employees to apply will be automatically assigned to it. When the limit is reached, the shift will be closed to any more applications. As employees apply, you'll see the total number of available slots reduced to reflect the number of people still needed.